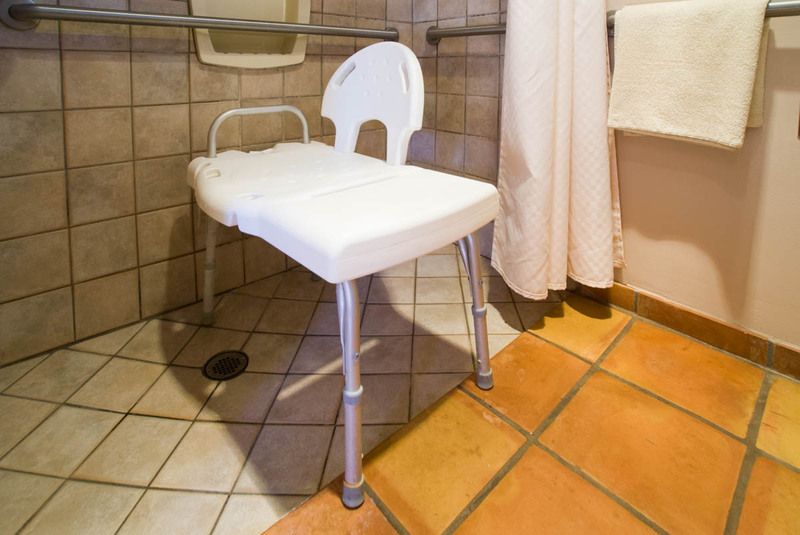 Have you ever checked into a wheelchair-accessible room, only to find a totally inadequate shower chair in the bathroom? Well, you’re not alone. Truth be told, most people prefer the same model they have at home; however sometimes that’s a tough request to fill. Although most hotels are equipped with shower chairs, not all properties have the same size or style. With that in mind, here are a few tips on how to request an appropriate shower chair, and what to do when you encounter an unsafe, unusable or inappropriate model. Variety is the key word when it comes to hotel shower chairs. In fact, I’ve seen everything from plastic pool chairs to padded shower benches – and lots of stuff in between. The best way to find out what kind of shower chair a hotel has is to simply ask — before you make a reservation. If the front desk can’t help you, then ask to be transferred to the housekeeping department; as these folks are intimately familiar with the equipment in the rooms. So what questions should you ask? Well, asking for a description is a good start, but you might also inquire if the shower chair has a back, if it has arms and if it’s padded. Also ask if they can find a brand name and model number on it. And although asking for a description is a good, requesting a photograph is even better. And in this day and age, it’s relatively easy for an employee to snap a picture and send it to you. Conversely, you can also take a photo of your shower chair and send it to the property, to illustrate your access needs. Of course, even with the best research, there’s always the possibility you’ll end up with an unsafe or unusable model. At this point, it’s best to talk with the manager to see if a suitable replacement can be found. If not, ask if they can find a property that can meet your access needs. And sometimes you just have to try and make the best of a bad situation. One frequent wheelchair traveler solves the problem with a lightweight plastic poncho. If she doesn’t feel she can use the shower chair provided, she transfers to the bed, places the poncho over her manual wheelchair, transfers back and rolls into the shower. Granted it’s not the best solution, but in a pinch sometimes you have to be creative. Of course the best way to guarantee you’ll get the shower chair you need is to travel with your own. So shop around for a sturdy model that folds up and fits in its own travel bag. And since US airlines do not charge to transport medical equipment, you won’t incur any excess baggage charges enroute. And although it may be cumbersome at times, it’s nice to know that you’ll have equipment that you can actually use when the need arises. Better safe than sorry!